On April 14, 2010, a class action lawsuit was filed in the United States District Court for the Eastern District of Michigan based in Detroit, seeking recoveries on behalf of thousands of adults in 14 states harmed by the sudden closure of ComputerTraining.edu schools in late December 2009. Plaintiffs’ counsel in the lawsuit are Thomas H. Howlett and Dean M. Googasian of The Googasian Firm, P.C. On January 27th, 2011, a federal judge certified this case as a class action. A copy of the Court's ruling can be found here. Class members should by now have received a court-ordered notice regarding the class action. A copy of the class notice can be found here. On November 22, 2011, a federal judge entered a judgment on behalf of all class members - more than 7,500 persons - against ComputerTraining. The lawsuit is being brought on behalf of adults who were enrolled in programs at ComputerTraining.edu schools in late December 2009 when the owners and operators of the schools abruptly locked the doors without warning and without providing any refunds, as well as on behalf of those who are graduates and who were denied continuing, “lifetime” placement services from the now-closed schools. The lawsuit also includes individuals who co-signed or otherwise became liable for a loan to pay the Computer Training tuition for these students. On August 8, 2010, a Second Amended Complaint was filed, naming Sallie Mae, Inc. as an additional defendant. The lawsuit alleges that the student loan lender is subject to the same claims and defenses that each of its borrowers could assert against Computer Training. A copy of the complaint can be found here. On February 18, 2011, a federal district judge granted Sallie Mae’s motion to dismiss, ruling that students must arbitrate their claims against Sallie Mae. Plaintiffs appealed the federal district judge’s ruling. The United States Court of Appeals for the Sixth Circuit upheld the judge’s ruling that arbitration was required. A copy of the appeals court’s ruling can be found here. Plaintiffs sought an additional appeal of this ruling, but it was denied. The closure of the ComputerTraining.edu schools affected adults who enrolled in and paid for programs in Delaware, Georgia, Illinois, Indiana, Kansas, Maryland, Massachusetts, Michigan, Minnesota, Missouri, Ohio, Pennsylvania, Virginia, and Wisconsin. The class action lawsuit alleges that the owners and operators of the ComputerTraining.edu schools told students that by paying tuition costing as much as $28,000 or more for a six-month program, they would be able to participate in training through which they could become computer technicians with four Microsoft certifications and thereafter receive continuing placement services from the schools in the field of information technology. Instead, the closure of the schools has left students who paid at least $13,500 in advance without an ability to complete the training programs or receive the continuing placement services at the CompterTraining.edu schools as promised. The lawsuit alleges that the Defendants have failed to pay back a penny of the money taken from students. 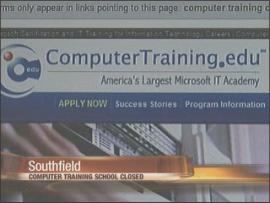 The lawsuit filed in federal court further alleges that the owners and operators of the ComputerTraining.edu schools were aware that their business was in dire financial trouble in 2009, but they concealed these financial difficulties and the risk that they could not provide the program and placement services from the students who were enrolling in their programs. Instead, according to the lawsuit, Defendants allegedly began an admissions push that included hiring numerous additional salsepeople, increasing the compensation and commissions to such persons, slashing tuition at many schools, and/or enrolling as many students as possible. That lawsuit alleges that during the admissions push in late 2009, Defendants knew or should have known that, due to ComputerTraining’s financial trouble, the students whom they were enrolling might not receive either the training program or the placement services for which some were paying as much as $28,000. According to the lawsuit, the Defendants also told students that they would receive full refunds if the school closed before they completed the program, then promptly locked the doors without giving any refunds. The Googasian Firm, P.C. , which filed the lawsuit on behalf of the former ComputerTraining.edu students, is a law firm that aims to help those who are victims of unfair, deceptive and abusive practices committed by for-profit schools and others. For-profit schools selling education to adults are big business in the United States. With direct mail campaigns and through newspaper, television and Internet ads, these schools, institutes and so-called "colleges" frequently attempt to lure adults into expensive programs of study with promises of future employment in high-paying jobs or easy-to-obtain credentials, high school "diplomas" or college "degrees." The owners and operators of these schools often make huge profits through tuition payments, typically paid with federal, state or private loans obtained by or on behalf of the students. Many state and federal laws prohibit unfair and deceptive practices and some laws also reward whistleblowers who report fraud committed against the government.